O God, who made the Bishop Saint Norbert a servant of your Church outstanding in his prayer and pastoral zeal, grant, we ask, that by the help of his intercession, the flock of the faithful may always find shepherds after your own heart and be fed in the pastures of salvation. Through our Lord Jesus Christ, your Son, who lives and reigns with you in the unity of the Holy Spirit, one God, for ever and ever. St. Norbert was born at Xanten near Cologne about the year 1080. As a young cleric he resided at the court of the Archbishop of Cologne and then at that of the emperor where he allowed himself to be influenced by the spirit of the world. But he was won back by grace; caught by a storm during a journey on horseback he made up his mind to take his clerical obligations seriously. After ordination to the priesthood he devoted himself to itinerant preaching. In 1120, on the advice of the bishop of Laon, he settled in the forest of Voix, not far from Soissons at a place called Premontre, in order to found a community of regular Canons. In 1126 he was sent to what was then one of the outposts of Christendom for he was appointed archbishop of Magdeburg. He died in 1134. Although a cleric, Norbert led a very worldly life for a number of years. The decisive change took place suddenly in 1115. While riding one day, he was overtaken by a thunderstorm. A flash of lightning struck the ground before him, the horse threw him, and he seemed to hear a voice upbraiding him for his conduct. As in the case of St. Paul, the experience wrought a complete transformation. Norbert decided to give away his property and income rights, and to lead a life of abnegation, devoting himself particularly to preaching. In 1120 he founded the Order of Premonstratensians (the first monastery was at Premontre) according to the rule of St. Augustine; approval came from Pope Honorius II in 1126. In 1125, he was named archbishop of Magdeburg. On July 13, 1126, Norbert entered the city and came barefoot to the cathedral. About to enter the archepiscopal palace, he was refused admission by the porter, who failed to recognize a bishop so poorly dressed. "You know me better and see me with clearer eyes than those who are forcing me to this palace. Poor and wretched man that I am, I should never have been assigned to this place," Norbert answered when the porter later sought his pardon. Read the life of St. Norbert written by his first disciple, Hugh, who succeded him in the government of his order. 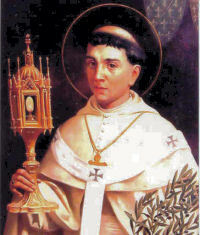 St. Norbert was called the “Apostle of the Blessed Sacrament”. Try making a holy hour today and pray to St. Norbert to help us to have a great love for Jesus in the Blessed Sacrament, too. For those interested in liturgical music you can read about Norbertine Gregorian Chant. The order has its "own" chant. Read this brief history and overview of the Norbertine Order. Here is an excellent link to even more information about St. Norbert. The Norbertine order has been around for 900 years. The Canons Regular of Prémontré, otherwise known as the Premonstratensians or the Norbertines, run the parish of Our Lady of England, Storrington. Learn more about their charism here.